*** SUCCESSFUL TOWN HOWL EVENT! THANK YOU TO EVERYONE WHO ATTENDED ESPECIALLY THOSE REPRESENTATIVES FROM LOCAL AND STATE GOVERNMENTS. The first annual Town Howl was a complete success. We had a great turn out from the community and those in local / state governments. Big Paws Up to Jen Hobgood from the ASPCA for the great presentation on the legislature and the wins that we have made in the animal community. Thanks to Amy Carotenuto for talking about Bunnell’s new anti-tethering laws. *** UPDATE: THANK YOU TO EVERYONE WHO SUPPORTED AND PUSHED FOR PROP. 67 TO BE ON THE NOVEMBER BALLOT. YOUR SUPPORT HAS SUCCEEDED AND THE ISSUE WILL BE ON THIS NOVEMBER’S BALLOT. BE SURE THAT YOU CONTINUE THE SUPPORT AND VOTE FOR THE GREYHOUNDS! The Florida Constitutional Revision Commission (CRC) is considering Prop. 67 – an amendment to the Florida Constitution that would phase out greyhound racing in our state by December 31, 2019. Prop. 67 will be discussed and debated by the CRC Executive Committee this month. It is critical that members of the committee hear from you. Please tell them you SUPPORT Prop. 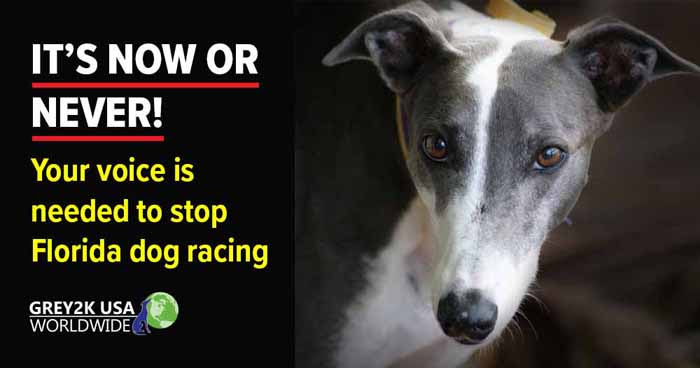 67 to phase out greyhound racing! Time is of the essence: Please call or email the members of the Executive Committee of the Florida Constitutional Revision Commission TODAY and urge them to Vote YES on Prop 67 to phase out greyhound racing in Florida. As a Florida resident, I urge you to vote “YES” on Prop 67 General Provisions. Prop 67 would phase out greyhound racing in Florida by December 31, 2019. Greyhound racing is illegal in 40 states. Florida is home to 12 of the 18 tracks still operating in the United States. Approximately 8,000 greyhounds endure lives of confinement at Florida tracks. For 20 to 23 hours a day, these dogs are kept in cages barely large enough for them to stand up or turn around. On average, a greyhound dies at a Florida racetrack every three days. Greyhound racing is a dying industry. Since 1990, the amount wagered n greyhound racing has declined 74% and tax revenue from greyhound racing has dropped by 98%. In fact, according to a study commissioned by the Florida legislature, the state is losing between $1 million and $3.3 million annually because regulatory costs exceed revenues collected by the state. Please vote “YES” on Prop. 67 to phase out greyhound racing. There was a major advance for the greyhounds when the Executive Committee of the Constitutional Revision Commission voted for a proposal to end dog racing! As a result, we are closer than ever to ending dog racing in Florida. However, we will not be done until the full Commission approves the measure. In the next phase, the full Constitution Revision Commission (CRC) will hold five public hearings around the state. At these hearings, they will take public testimony on all pending proposals, including Proposal 67 to phase out greyhound racing. Greyhound breeders are already organizing for these hearings, and plan to have many speakers defend the cruelty of dog racing. We can’t let them get away with this. It’s absolutely crucial that you ask Commissioners to Vote Yes on Proposal 67! Please also ask a friend to join you. The Greyhounds need as many voices as possible. It’s now or never! If you have a rescued greyhound, be sure to tell them about your four-legged friend and provide a photo if you have one! Once these hearings are complete, the CRC will take final action on Proposal 67. If we succeed, voters will then decide the fate of greyhound racing this November. Please be sure to attend the public hearing closest to you, and help us give the Greyhounds a voice. Together, we can end this cruelty for good. *** UPDATE: PONCE’S LAW HAS PASSED!!!! HB 473/SB 952 “Ponce’s Law” is named for a dog named Ponce, who, according to media reports, was beaten to death in Ponce Inlet, Florida in 2017. The incident resulted in strong public sentiment that Florida’s animal cruelty law should be strengthened to ensure that such cases are taken seriously. Experts agree that proper intervention in animal cruelty cases can protect both people and animals. According to the National District Attorneys Association: “The Link between violence to people and violence to animals is well documented by research, both nationally and internationally. In its simplest form: violence to animals is a predictor that the abuser may become violent to people….” Clarifying a judge’s ability prohibit animal cruelty offenders from having contact with animals can have a significant impact on protecting animals and people in our communities. F.S.S. 828.12 (2)(a) prohibits aggravated animal cruelty: “A person who intentionally commits an act to any animal, or a person who owns or has the custody or control of any animal and fails to act, which results in the cruel death, or excessive or repeated infliction of unnecessary pain or suffering, or causes the same to be done, commits aggravated animal cruelty, a felony of the third degree.” Currently, aggravated animal cruelty is classified under the state’s sentencing guidelines (F.S.S. 921.0022) as a level 3 violation (16 points). F.S.S. 828.073 Animals Found in Distress allows a court to enjoin the custody or possession of an animal if a court determines that an owner is unable to properly care for the animal. HB 473/SB 952 also reclassifies the sentencing level for violations of aggravated animal cruelty in the Criminal Punishment Code from a level 3 to a level 5 violation, which provides more appropriate judicial discretion in sentencing those who commit this serious crime. An October 2017 Poll conducted by Mason-Dixon Polling & Strategies found that 84% of registered Florida voters support clarifying that judges can require someone convicted of animal cruelty to have no contact with animals during their probation. In 2017, Hurricane Irma resulted in hundreds of lost or stray dogs and cats across Florida, putting an added strain on already beleaguered Florida families and overburdened animal shelters in the storm’s aftermath. In recent years, several owned family pets have been euthanized accidentally in Florida shelters, including a 17-year-old beloved Labrador retriever in Manatee County and a case in Escambia County that resulted in a lawsuit against the county. Many animal shelters in Florida already utilize the reasonable policies and procedures outlined in HB 823 /SB 1576. However, like hurricanes and wildfires, lost pets don’t recognize county lines on a map. Providing minimum statutory safeguards for owners of lost pets is necessary to elevate and standardize these practices across our state and to ensure that pet owners are afforded the opportunity to quickly and reliably claim their lost pets. Local ordinances often set minimum stray hold periods deemed appropriate to the community, but Florida currently has no statewide requirements for animal shelters or humane organizations with respect to owned lost or stray dogs or cats. HB 823/SB 1576 will help animal shelters of all sizes reunite lost pets with their owners by requiring that shelters and humane organizations that accept lost or stray dogs and cats develop reasonable policies and procedures to quickly and reliably return lost pets to their families. Each policy and procedural safeguard in HB 823/SB 1576 provides broad discretion and flexibility for both larger and smaller governmental and non-profit shelters to implement community-appropriate, reasonable minimum standards for returning lost pets to their owners. An October 2017 poll by Mason-Dixon Polling and Strategies found that 77% of registered Florida voters support requiring shelters that accept lost or stray dogs and cats to develop reasonable policies and procedures to ensure that lost pets are quickly and reliably returned to their families. Ryan, Patti. Sept. 15, 2017. “As Irma Howled, Hundreds of Tampa Bay Area Cats and Dogs Got Lost.” Tampa Bay Times. Accessed online 13 December 2017 at http://www.tampabay.com/news/humaninterest/as-irma-howled-hundreds-of-tampa-bay-area-cats-and-dogs-got-lost/2337541 . Garcia-Navarro. Sept. 12, 2017 “Miami Animal Shelter Swells with Lost Pets in Wake of Hurricane Irma.” National Public Radio. “All Things Considered. Accessed online 13 December 2017 at: http://www.npr.org/2017/09/12/550492776/miami-animal-shelter-swells-with-lost-pets-in-wake-of-hurricane-irma Cohen, Howard. Sept. 13, 2017. “Pets Displaced by Irma need a place to stay. So 100 other dogs and cats hit the road.” Miami Herald. Accessed online 13 December at http://www.miamiherald.com/news/weather/hurricane/article173102131.html . Weather.com. Sept. 9 2017 “Helping Lost Pets from Irma Find Their Way Back Home.” weather.com. Accessed online 13 Dec. 2017 at: https://weather.com/storms/hurricane/news/irma-lost-pets/2017 Alvarez, Johanna A. Sept. 19 2017. “If you lost your pet during Hurricane I rma, here’s what you should do.” Miami Herald. Accessed online 13 December 2017 at: http://www.miamiherald.com/news/weather/hurricane/article174186976.htmlAnderson, Jasmine. Sept. 15, 2017. “South Florida family looking for dog they lost while fleeing Irma.” ABC3 WEAR TV Pensacola. Accessed online 13 Dec.2017 at http://weartv.com/news/local/south-florida-family-looking-for-dog-they-lost-while-fleeing-irma . Aronson, Claire. “His lost best friend was found and taken to animal shelter—and killed the same day” Bradenton Herald. Accessed online 13 December 2017 at http://www.bradenton.com/news/local/article124559479.html Story reprinted in the Miami-Herald and retold in the Washington Post at https://www.washingtonpost.com/news/animalia/wp/2017/01/23/whats-a-no-kill-animal-shelter-the-answer-is-more-complicated-than-it-seems/?utm_term=.8e2a9b2d71c7. Robinson, Kevin. Aug. 17, 2015. “Woman Sues Escambia over Mistakenly Euthanized Dog.” Pensacola News Journal. Accessed online 13 December 2017 at http://www.pnj.com/story/news/local/escambia-county/2015/08/17/woman-sues-escambia-mistakenly-euthanized-dog/31868803/ .